Ilha Grande is a beautiful island in Brazil that is about 150 kilometers from Rio di Janeiro. The largest town on the island is Abraao Village, and this is where you'll find most of the island's accommodation. There are a variety of options available for all types of travelers, but if you're on a budget, hostels and camping may be your best options. Abraao Village has two main streets that run parallel to each other. One runs along the ocean and the other is set back. Most of the town's budget accommodation is found on the second street. There are several good hostels in town, and a few that are a bit outside of the town. If you want a more peaceful and natural setting, then you'll likely prefer a place outside of town. How much do hostels in Brazil cost? A good hostel for backpackers, small groups, and independent travellers. Biergarten Hostel was opened in 2010 and it is a comfortable and fun place to stay. 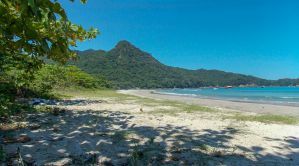 It's located in Abraao - Ilha Grande and is less than a block from the beach. It's also close to all of the area's most popular attractions. If you're looking for comfort, fun, and affordability, then this is the place to stay. There's an on-site restaurant and bar that serves salads, seafood, meat, and vegetarian dishes. The bar is a fun place to hang out in the evening where you can enjoy popular Brazilian cocktails and listen to Latin music. There are twin private rooms available with either shared or attached bathrooms. There are also dorms that sleep three, four, six, or eight people. The rooms are kept clean and the beds are comfortable and this is a great place to base yourself while you're exploring the island. 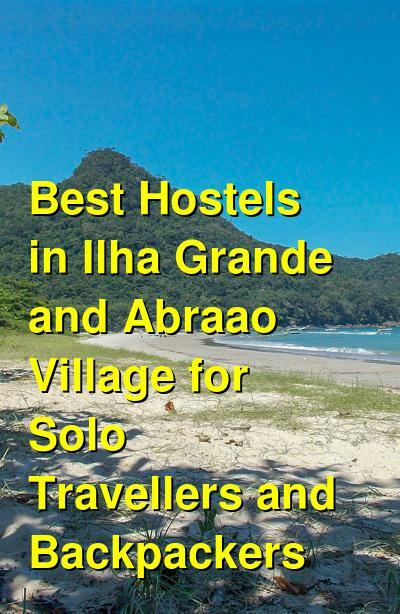 Harmoni Hostel is another great option in the Abraao Village on Ilha Grande. It's in a quiet area but is still close to the ferry pier and just a couple of minutes from the beach. The staff are great and they ensure that the rooms are clean and the atmosphere is relaxed. The owner has worked as a tour guide and there are staff members that speak English, French, and Spanish. The hostel has two dorms that sleep up to ten people. There are also two dorms that sleep up to six people and three private rooms that each have a double bed. Every room has its own bathroom with a hot shower. If you're looking for an affordable and comfortable place to stay then this is a good option. You'll be assured a good night's sleep here, but it is still a social place where you can meet other travelers. Pousada Cachoeira is another popular hostel in the area. It's located about ten minutes from the pier and seven minutes from Abraao Beach. It's in the middle of the forest and has a beautiful tropical garden next to a clear stream. This is a truly wonderful place to escape the chaos of travel. It has a quiet setting and a cozy atmosphere and you'll quickly feel right at home. The hostel is a favorite for couples and groups of friends that want a relaxing but affordable place to spend some time. It has the feel of being set in a jungle and there are many great amenities available for guests including a good breakfast with fruits, juice, coffee, milk, bread, cheese, jam, and eggs. The hostel has a wonderful staff who can help you with anything you may need. Among them they speak English, Portuguese, German, and some French. This hostel appeals to a diverse group of international travelers and it's a fun place to get to know other travelers. There are twin, double, and four bed private rooms available, and every room has it's own private bathroom. Che Lagarto Hostel Ilha Grande is another popular place to stay. It's part of the Che Lagarto Hostels chain, which is one of the largest private hostel chains in South America. It has a reliable reputation and you can be assured a fun and relaxing time here. The hostel offers great views of the island and it has a fun and youthful atmosphere. It's in a very convenient location and is close to Abraao Village. It's also close to anything you might need. If you're looking for a social place to stay where it's easy to meet other travelers, then this is a great option. There are always other guests around to hang out with and there are plenty of common areas including a television room, a bar, and a playroom. There's also a shared kitchen where you can prepare your own meals.